DeKalb School of the Arts junior named finalist for Georgia’s Poet Laureate’s Prize. Sophia Seufert, a junior at the DeKalb School of the Arts, was a finalist for Georgia’s fourth annual Poet Laureate’s Prize, an award for an original poem written by a Georgia high school student. Gov. Nathan Deal, his wife Sandra Deal joined Georgia Poet Laureate Judson Mitcham along with the contest winner and finalists for a special event on May 2 in the governor’s office at the State Capitol in Atlanta. The award is presented in conjunction with the Georgia Council for the Arts. As a finalist, Seufert’s poem, “A Day in Her Shoes: 3 Perspectives of Women Throughout History,” will be published in Atlanta Magazine alongside those of the winner and other finalists. In addition to poetry, Seufert enjoys composing songs on her ukulele. 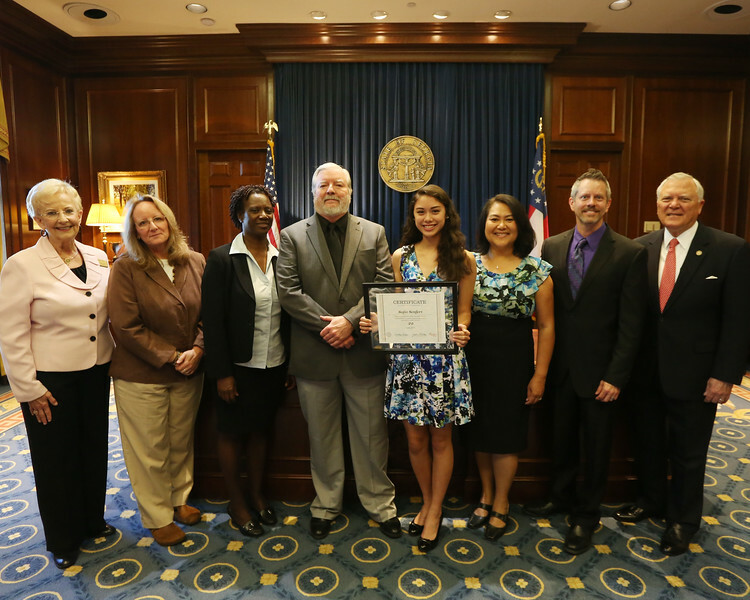 She also participates in the show choir, mock trial, Beta Club, Women’s History Club, Thespians, and Atlanta Young Singers Choir. To view Sophia’s poem, please click here.